Chronic noncancer pain (CNCP) is common in the general population as well as in people who have a substance use disorder (SUD). Chronic pain is not harmless; it has physiological, social, and psychological dimensions that can seriously harm health, functioning, and well-being. As a multidimensional condition with both objective and subjective aspects, CNCP is difficult to assess and treat. Although CNCP can be managed, it usually cannot be completely eliminated. When patients with CNCP have comorbid SUD or are recovering from SUD, a complex condition becomes even more difficult to manage. Studies indicate that CNCP and addiction frequently co-occur (Chelminski et al., 2005; Rosenblum et al., 2003; Savage, Kirsh, & Passik, 2008). Chronic pain and addiction have many shared neurophysiological patterns. Most chronic pain involves abnormal neural processing, which can occur at various levels of the peripheral and CNS. Similarly, the disease of addiction results when normal neural processes, primarily in the brain’s memory, reward, and stress systems, are altered into dysfunctional patterns. A full understanding of each condition is still emerging, and there is much to be learned regarding neurobiologic interactions between the conditions when they co-exist. • Both are neurobiological conditions with evidence of disordered CNS function. • Both are mediated by genetics and environment. • Both may have significant behavioral components. • Both may have serious harmful consequences if untreated. • Both often require multifaceted treatment. Chronic pain and SUDs have similar physical, social, emotional, and economic effects on health and well-being (Green, Baker, Smith, & Sato, 2003). Patients with one or both of these conditions may report insomnia, depression, impaired functioning, and other symptoms. Effective CNCP management in patients with or in recovery from SUDs must address both conditions simultaneously (Trafton, Oliva, Horst, Minkel, & Humphreys, 2004). Both pain and responses to pain are shaped by culture, temperament, psychological state, memory, cognition, beliefs and expectations, co-occurring health conditions, gender, age, and other biopsychosocial factors. Because pain is both a sensory and an emotional experience, it is by nature subjective. When nociceptors are excited, the stimulus is converted through transduction into action potentials that travel to the dorsal horn of the spinal cord. 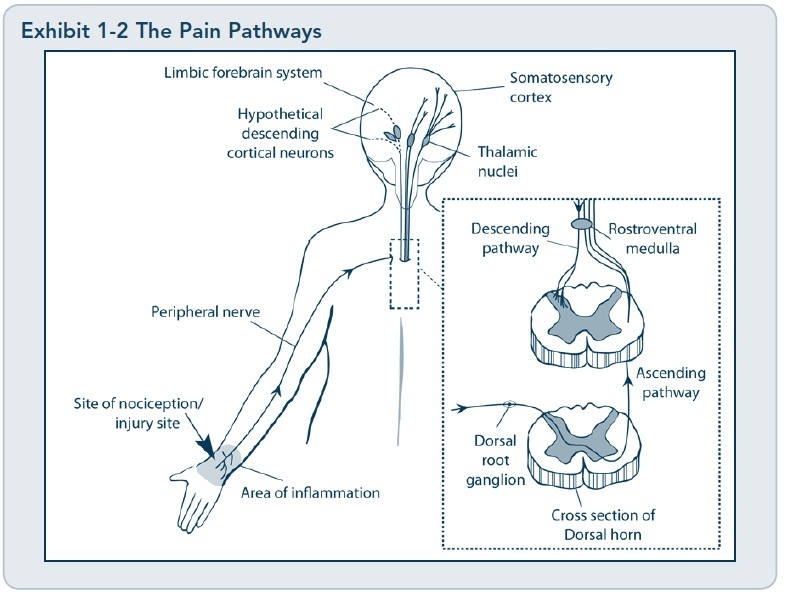 Signals then continue from the dorsal horn to the brain along multiple pathways in the cord: to the somatosensory cortex, where pain is evaluated; to the limbic system, where emotional reactions are mediated; to the autonomic centers that control such automatic functions as breathing, perspiration,and heart rate; and to other parts of the brain, where a behavioral response to the stimuli is determined. Nociceptive impulses are also transmitted to nearby terminals of the same nerve, where they may lead to diffuse pain and release of inflammatory substances that produce the flare and swelling that is a protective response to tissue injury (Exhibit 1-2). Nociceptive input triggers a pain-inhibiting response. Signals traveling the ascending pathways are met by descending signals that emerge at various points along the spinal cord and brain. This antinociceptive response involves a panoply of chemicals, including endorphins, enkephalins, gamma-aminobutyric acid, norepinephrine, serotonin, oxytocin, and relaxin. Inhibitory signaling serves to attenuate nociceptive input, dampening the formation of pain sensation and providing pain relief (Brookoff, 2005). Pain may be acute (e.g., postoperative pain), acute intermittent (e.g., migraine headache, pain caused by sickle cell disease), or chronic (persistent pain that may or may not have a known etiology). 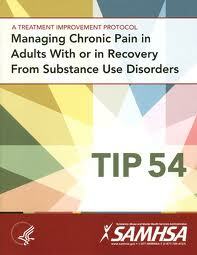 These categories are not mutually exclusive; for example, acute pain may be superimposed on chronic pain. Acute nociceptive or neuropathic pain can transform into chronic neuropathic pain in which the original sensations are extended and amplified. 6) Develop a treatment plan that addresses pain, functional impairment, and psychological symptoms; and closely monitor patients for relapse. 7) Discuss that even the best treatment is unlikely to completely eliminate chronic pain, and why efforts to achieve total pain relief can be self-defeating.